So, you're travelling solo and you've got a 17 hour layover in Singapore: what do you do? If you're like me, you check into a cute hotel, smash some hawker food and go on a one-woman gin crawl of some of the city's finest cocktail bars. 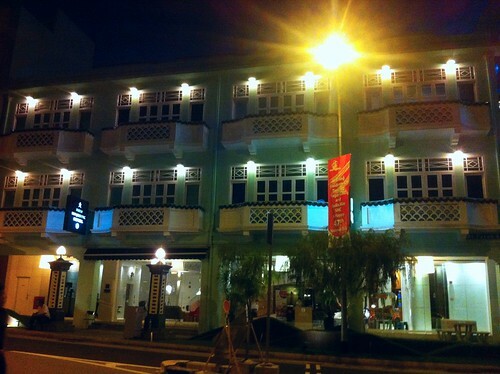 I suggest staying at the New Majestic Hotel, a gem which I found while trawling the more affordable end of Mr & Mrs Smith's Singapore selection. 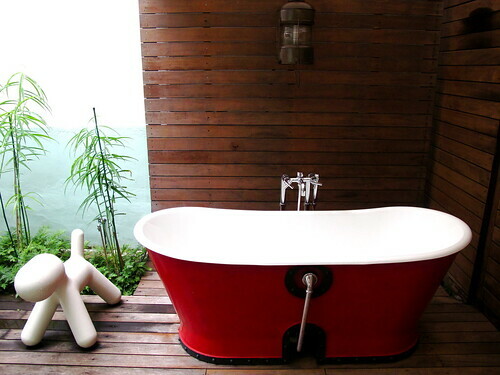 Each room in the hotel is decorated by a different local designer/artist; I was ridiculously enamoured with my room's lurid feature wall (by Andre Tan) and the outdoor tub. Time for HAWKER FOOD. 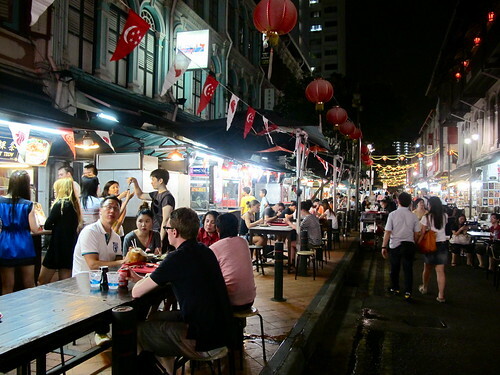 Get thee to a hawker centre (Newton Circus, Chinatown Complex Food Centre, Maxwell Food Centre, Lau Pa Sat, Makansutra Gluttons Bay, Zion Riverside Food Centre... or really just about any other) or a street lined with food stalls. 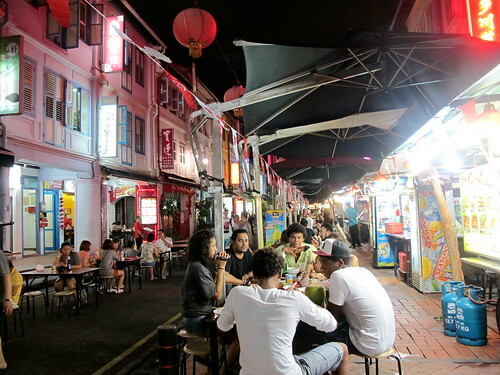 This time I went to Jalan Makanan Chinatown, Chinatown food street, because it was just a short stroll from my hotel. 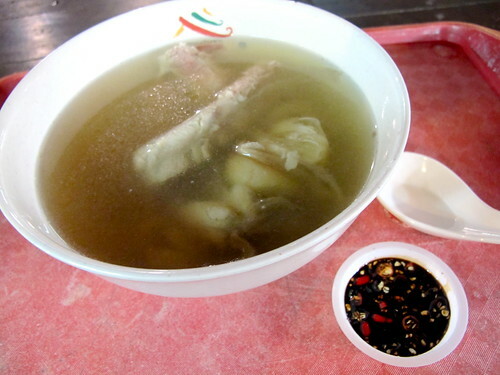 Bah kut teh ("meat bone tea"): pork ribs simmered in a fragrant, magical broth. It will give you superpowers. 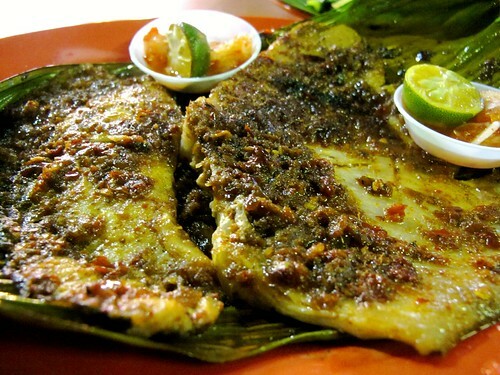 And my favourite hawker dish: ikan pari bakar (aka BBQ stingray sambal). YESSS. The first cocktail bar I went to was the speakeasy-ish 28 HongKong Street, opened last year by head bartender and general manager Michael Callahan straight outta San Francisco. There's no visible signage: open the metal door on the left, under the yellow lamp, and the hostess in the entrance vestibule will ask whether you have a reservation (they're recommended, but I chanced it solo and was fine). Inside the bar you can barely make out the menu given the dim lighting but the cocktails on offer are impressive (a taste of the drinks menu can be seen here), specifying that the house uses an "honest pour" single shot of 45ml, as opposed to Singapore's standard 30ml. Expect to see hand-chipped ice, house-made ingredients and several of the more recent cocktail fashions, including barrel aging. The bar food is on-trend American and wouldn't look remotely out of place in Melbourne's Hipzroy: think fried chicken and waffles with maple syrup, patty melt sliders with fried pickle, ceviche mojado, and truffled mac n cheese balls. 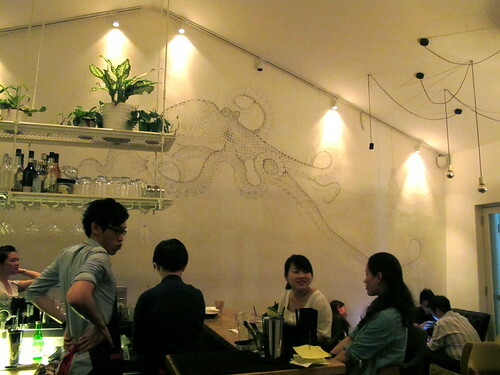 In marked contrast to 28 Hongkong Street's a darkened speakeasy fitout, Bar Stories is airy and light, with high ceilings, white walls and an intricate octopus mural drawn with a pen. 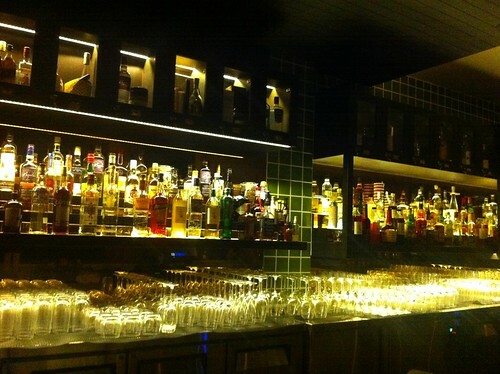 It's located on Haji Lane (in Singapore's Arab Street district, favoured by fashionistas and hipsters) on the floor above a Scandanavian mid-century furniture store, and stylish pieces are featured throughout the bar itself. There's no printed menu: just tell one of the savvy bartenders the sort of thing you're after and they'll take care of the rest (I had a first rate South Side and had a very nerdy conversation with the bartender about gin). On the recommendation of two of Melbourne's finest barmen, the third and final cocktail bar I visited was Chinatown's The Cufflink Club, which opened a few months ago headed by owner/bartender Joel Fraser (formerly at Tippling Club* and before that at Melbourne's own Der Raum). Joel runs a fun and friendly ship where the banter is sparkling, the music tends toward old-school-fun-times (vintage MJ on my visit) and the cocktails are expertly crafted without taking themselves too seriously - as evidenced by some of the names on the signature drinks half of the menu such as Fifty Shades of Grey (yes it has house Earl Grey gin in it), the very appley iDrink, and Rumbo: First Blood. The menu also has a "digitally remastered" section of fresh takes on old drinks - I can recommend the Philadelphia Inquirer 1910 - and foodwise, the Club serves European charcuterie, imported cheeses and marinated nibbles. An excellent way to round off the night. 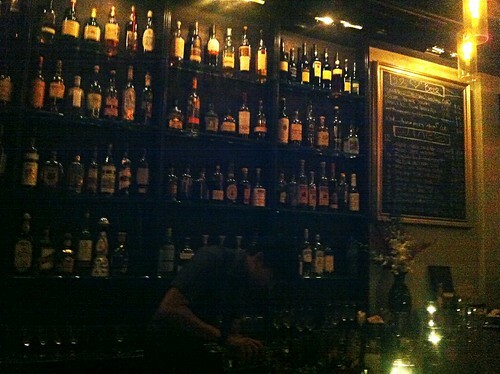 * If it hadn't taken 45 goddamn minutes to find a taxi (they were changing shifts), I'd have visited Tippling Club too. 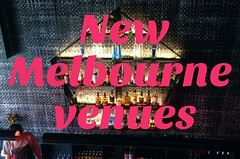 Lots of Melburnians suggested I visit, not only for the molecular-leaning cocktails but also for (ex head chef at Vue de Monde) Ryan Clift's food. Next time! Great post there are often times i am stuck in a country for a very short time and this is exactly what i need i am looking forward to my next lay over in singapore!!! Thanks for a post and pictures conjuring memories of Singapore. 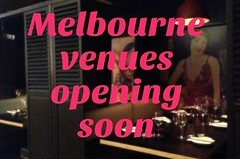 How cool is the New Majestic eh? Price wise, it's super reasonable too although it's a little disconcerting that people in the restaurant beneath pool can look up and see you swimming. Best of all - so close to Maxwell, lah! BBQ stingray is my favourite Singapore hawker dish of all time and i made a similar bee line for it on a similar - food fuelled - stopover last year. I has such a wonderful 1.5 day eating extraveganza that i promised myself Singapore would be a food destination in its own right, in future. Not just a stopover. Still working on that one! I was all about those truffled mac n' cheese balls at 28 Hong Kong Street! 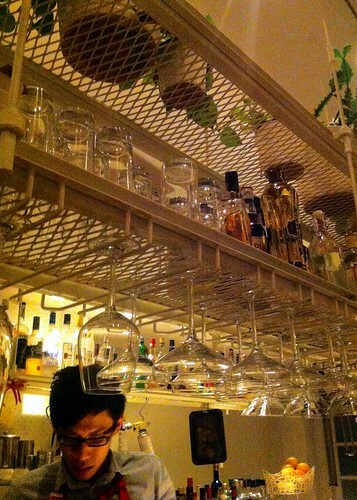 I've also heard a lot of about Tippling Club, will have to check it out. Great little round up though! I have the same issue as tesse, i dont drink, but would like to visit all these places before leaving singapore after 4 years of expatriatn. Hi! Have you given up your blog?